In 'Portrait of a Young Girl,' Petrus Christus made his subject real but mysterious, fetching but inviolate. 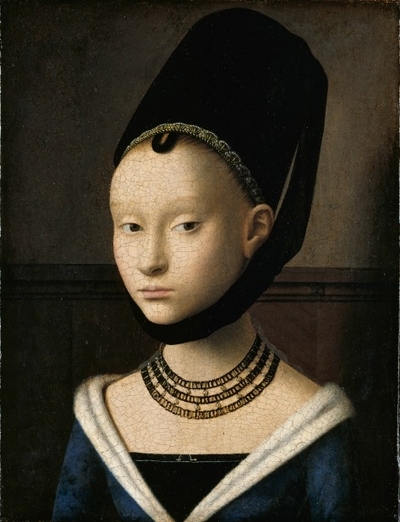 "Portrait of a Young Girl" (c. 1470) is a small, seemingly simple picture, measuring less than 9 inches by 11.5 inches. Painted in oil on oak by Petrus Christus (c. 1410-1475/76) in a cool, muted palette, the girl wears almost no expression. She's not conventionally pretty. Yet there's something inexplicably captivating about her that pulls you in and holds your attention, almost unwillingly. How did Christus create such visual power? In a masterly way, he embedded the painting with clues about the sitter's social status and the period in which she lived, but he left her an enigma. He made this young girl real but mysterious, fetching but inviolate. Christus, originally from a Brabantine village in the Low Countries, began his known career soon after he moved west to Bruges (now in Belgium)—a thriving international commercial center, a favorite of the Burgundian dukes, a city whose citizens were eager consumers of luxury goods and art. Records show that in 1444, within months of his arrival, he purchased his citizenship, which allowed him to join the painter's guild. He quickly won important commissions and prospered, creating religiously themed works and portraits for his patrons. After his death, though, he faded from prominence. Until fairly recently, Christus was viewed by art historians as a derivative disciple of Jan van Eyck. He was much more. "Portrait of a Young Girl," one of his last known paintings, illustrates his innovation, deftness and finesse. Unlike portraits by his predecessors, including Van Eyck, who favored flat, neutral, often black backgrounds for their portraits, Christus placed this girl in a room. Instead of floating in space—like the sitters in the Van Eycks that hang beside "Portrait of a Young Girl" in Berlin's Gemäldegalerie—she is anchored. "This girl is living in a real world," said Stephan Kemperdick, the curator of Early Netherlandish and German Painting at the Gemäldegalerie. Notably, it's a rich room: The wall behind her is plaster, indicating that the home was probably made of stone or brick at a time when most houses were made of wood. Christus positioned the girl close to the wall, but not against it, and uses its horizontal molding to push her forward toward the viewer. He left enough room behind her for the source of light—coming from the left—to cast her shadow on the right edge of the picture. With meticulous brushwork, Christus painted many other telling details about his subject, making her just as real as her surroundings. She wears a large black velvet headdress, a matching dark chemise, and a rich, deep-blue patterned gown trimmed in fur. The bonnet is intricately embroidered with gold thread; her neck is ringed with a three-strand necklace. She also wears an extremely thin and very costly gossamer "tissue" draped around her shoulders; it meets at the center of her bodice and is secured by a gold pin. This girl is definitely very wealthy, probably an aristocrat. There's a spatial balance between the girl and her surroundings. Yet Christus concentrates our attention on her by making her head a little too big for her slight body, then accentuating it with an elongated neck and the large headdress, with a heavy, wide strap across her chin. Christus gives her sharp, perfectly modeled features: almond-shaped eyes, a pouty mouth and high, slanted cheekbones. The bonnet is positioned to show the roots of her strawberry-blond tresses. Echoed shapes throughout the picture—her face and her ear; her brow line, the strap and her necklace; the triangles formed by her clothes—unify it. The girl is not faultless, though. Her eyes are not precisely aligned, the lids don't match exactly and she's slightly cross-eyed—these details compel close inspection by the viewer. Hauntingly still, she looks out directly, as if aware of being seen. "And yet," said Mr. Kemperdick, "her expression indicates that she's untouchable. She's not staring, but she is looking through you." He believes that she is perhaps 14 years old and definitely a virgin. Who was this elegant girl? Various theories have been proposed over the decades, but the best evidence suggests that she was a granddaughter of John Talbot, the first earl of Shrewsbury—either Anne or Margaret Talbot. Their aunt, Elizabeth Talbot, the Duchess of Norfolk, attended the 1468 marriage in Bruges of Charles the Bold, Duke of Burgundy, and Margaret of York, a sister of King Edward IV of England. It was an extravagant event that lasted for days, filled with opulent banquets, jousts, dramatic performances, festivals, spectacles and lavish decorations. One or both of the Talbot girls may have traveled to it with Elizabeth. Christus was there, too. The painting came to the Gemäldegalerie in 1821, one of some 3,000 works purchased by the Prussian state from the English merchant and collector Edward Solly. At the time, early Flemish paintings like "Portrait of a Young Girl" were not much coveted by museums in other countries. Now she is considered to be a brilliant jewel.